Since reformist leader Mohammad Khatami endorsed incumbent President Hassan Rouhani's second-term election campaign, hardliners have been working to suppress the message, as well as Rouhani's criticism of his powerful, hardline opponents, the Center for Human Rights in Iran (CHRI) has learned. Most recently, the judiciary has forbidden Rouhani's election campaign staff from publishing remarks by Rouhani that have been critical of judicial officials or the security and military forces, an informed source told the Center for Human Rights in Iran (CHRI) on May 17. "We like the Revolutionary Guard and the Basij militia. All we are asking is to carry out the wishes of the imam (the leader of the 1979 revolution, Ruhollah Khomeini), who said that the military and security forces should not interfere with any political party or organization," said Rouhani on May 17 during his final campaign speech in the city of Mashhad. The president was implying that the paramilitary forces have been interfering in Iran's politics, which Khomeini-who created the forces after the 1979 revolution-explicitly forbade them from doing. Rouhani's campaign media advisers have been summoned and forced to sign a written pledge saying they would not promote the comments, an informed source told CHRI. The statement also included a pledge to abide by the ban on printing images and statements by reformist leader Mohammad Khatami, and detained opposition leaders Mir Hossein Mousavi and Mehdi Karroubi, who have been under extrajudicial house arrest since February 2011 for peacefully disputing the result of the 2009 presidential election. 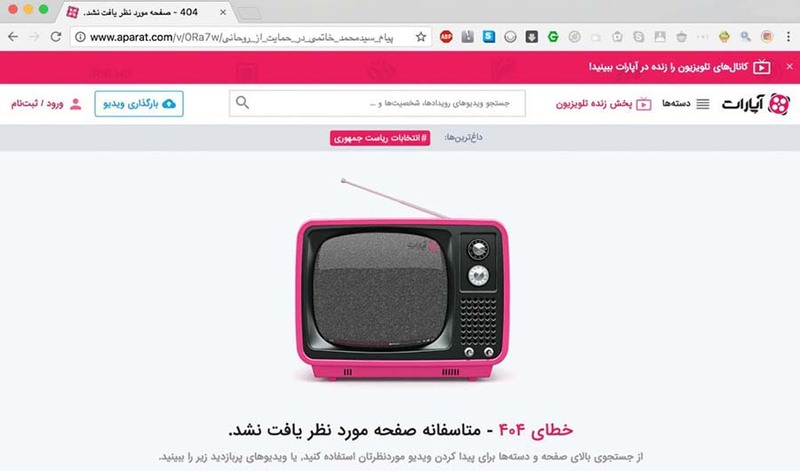 showing irrelevant info on a search engine on Iran's domestic internet. Meanwhile, several Rouhani campaign offices have been attacked by police and plainclothes agents, who used tear gas and "beat up" staff and supporters. An eyewitness who works for the Rouhani campaign in Tehran said the attacks took place against offices in several cities from the evening of May 16 until the late evening of May 17. "On Wednesday evening, the police and plainclothes agents from an unknown agency showed up at Hassan Rouhani's campaign offices in several cities, including the Sadr headquarters in Tehran, and would not allow supporters to distribute campaign material such as posters and banners among the people," said the eyewitness, who requested anonymity for security reasons. "At some campaign office locations, staff were beaten and kicked by the plainclothes agents, but no one was arrested," added the source. On May 16, a Rouhani supporter tweeted: "Just now, Rouhani's campaign office in Valiasr [Sq. in Tehran] was attacked with tear gas, and people and staff scattered! Everyone removed their purple wristbands fearing they might get identified." 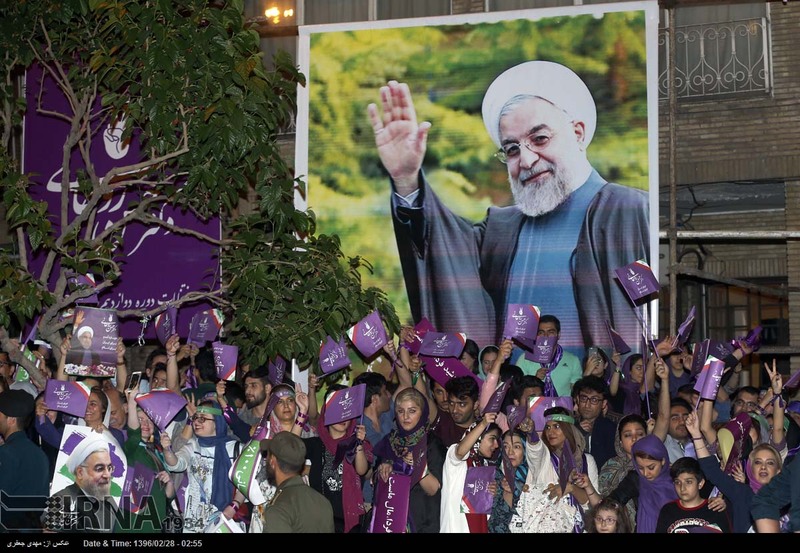 Purple is the Rouhani campaign's official color. A Rouhani campaign worker confirmed the incident to CHRI, adding that the attacks were coming from supporters of Rouhani's main rival, Ebraim Raisi. "Agents related to the Revolutionary Guard and Raisi's supporters attacked Hassan Rouhani's campaign offices throughout Tehran hoping to dampen the people's election fervor," said the source. "It seems they are reacting to the knowledge that they are going to lose." Another witness told CHRI: "The plainclothes agents trashed the office, beat up the staff and tore up Rouhani's posters. They dispersed the crowds and threw tear gas at the entrance to the headquarters. At this point, the police did not get involved anymore, but they did divert traffic. They told us to evacuate and stop distributing posters." Iranians will go to the polls to vote for their next president and local councils on May 19, 2017. Campaigning is officially banned after midnight on May 18, 2017. The intimidation of Rouhani's media advisers came a few days after judicial authorities contacted several Iran-based website administrators by phone to demand the removal of Khatami's video message endorsing Rouhani. "We started on a path with Mr. Rouhani and we are at the halfway point," said Khatami in a video message released on May 14. "Repeat your vote for the dear Mr. Rouhani to strengthen hope and a better future." Khatami's video message endorsing Rouhani eliminated from Aparat's website. The influential former president (1997-2005) posted his message online because Iranian media outlets have been banned from mentioning him. "I can attest that Mr. Rouhani's government has been a successful one," he said, referring to the final nuclear deal signed in 2015 and decreasing inflation. "With all the limitations, problems and high expectations, the government has served the revolution, the people and the country very well." A source at the Rouhani campaign headquarters told CHRI: "After the Khatami video in support of Rouhani was published, we received a call from the prosecutor's office threatening us with arrest if we did not delete the video from our website." Iran's domestic version of YouTube, Aparat, has also removed a copy of Khatami's video endorsement from its site without explanation. When Aparat removed a video from Khatami backing reformist parliamentary candidates in the February 2016 elections, it posted a note explaining that it had been ordered to do so by Iran's principal online filtering body, the Taskforce to Determine Instances of Criminal Content.